If you have been wanted to spend some of your bucks on buying a fun and easy to use longboard then you have clicked on the right article because we will be reviewing the White wave bamboo longboard for you in our article today. We will crack down White wave bamboo longboard layer by layer and look over every feature to make sure that you have the clearest picture. You will get an in-depth look into some of the advantages, cons and a few queries as well about this product. So, will the White wave bamboo longboard meet your expectations with flying colors or will it fall short? We will find out soon. Keep reading! This longboard from White wave is made out of high-quality bamboo. It uses 2 pairs of the wheel that protrude out from the sides. It is lightweight and easy to use; even for a beginner and an adult. The nice thing about this series of longboards from the White wave is that you have heaps and heaps of options to choose from. You have about 11 longboards in this series; each portraying a different design, a different appearance, and entirely new personalities. The White wave bamboo longboard, the Bandit, weighs just 3.5 pounds. 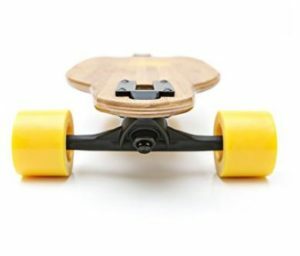 You could say that your average skateboard weighs a tad bit lesser but this is not a skateboard and is used for the entirely different purpose. This is why, making it with a little bit of bulk is essential to help stabilize it, especially when you will be on it! It measures 39.5 x 5.2 x 10.9 inches in dimensions and right off the bat you can detect that it was a very wide base and a good length; this is always good when comes to longboards. It helps with cruising and swaying at high speeds without any resistance. You will have absolutely no trouble carrying it in the back of your backpack when you are not using it; it may not be compact (it is not supposed to be!) but it is a very lightweight longboard. The White wave bamboo longboard uses a drop through trucks. Now, this may not hold much significance to people who know nothing about it, but for designers, a drop through truck means performance. A drop through truck is basically where the trucks have been mounted and designed to be on the top of the board through a cut-out hole or a slot. Here’s why it is no special: it gets the deck of the longboard much closer to the ground. This means optimum stability, especially when boarding downhill at high speeds. The trucks of the White wave bamboo longboard are 180 mm or & inch which is more than enough stability and are also best for cruising with sharp turns. Having said that, the truck do feel misplaced since they make a lot of noise during rides. 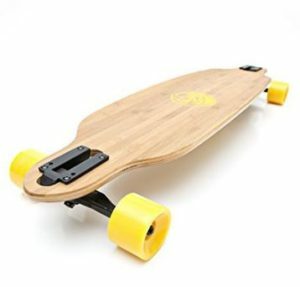 The deck of this longboard is slightly or medium concave which allows the user to feel more comfortable; the slight curvature make turning and swaying much easier than just a flat deck. And because the deck is nearly 40 inches in length, it will give you the best of it during downhill rides. Now, for the wheels. The White wave bamboo longboard uses 70 mm x 50 mm high rebound Urethane wheels that can take on some serious weight. and yet at the same time, are just soft enough to grip onto the ground with Herculean strength. Since the board uses 70 mm wheels it, yet once again, will so much more downhill security. The bearing used on the White wave bamboo longboard is the Abec 9 Hellion bearing that has built-in spacers. Now, this choice is bearing is fast and durable just fine, but a ceramic bearing could have done so much better if you ask us. Ceramics bearing are high performance and last pretty much your whole life if you don’t do stupid stunts with your longboards. The White wave bamboo longboard’s deck is made out of several layers of high quality, fortified and sturdy bamboo and Canadian Maple; and as we know already, nothing beats Maple, neither the syrup nor the wood! You have a clear grip tape on the deck that adheres to the user’s foot just enough to secure them. The trucks you get on the White wave bamboo longboard are made out of quality aluminum that repels rusts and impact damages. So far, this longboard is promising a future with a long lifespan. You have your heat transferred graphics, screaming yellow wheels, and matte black trucks. And of course, the Longboard logo printed yellow on top and bottom of the deck as a signature. The White wave bamboo longboard, the Bandit especially, is our favorite longboard in the series. It is bursting with brightness and energy with its bright yellow theme and polished wood. Is there a way to silent the annoying squeakiness of the trucks? Answer: Yes, there is! A little lithium grease or silicone lubricant will get rid of it immediately. How many pounds can the White wave bamboo longboard take on? Answer: We users up to 250 pounds using it without any problems. Alrighty then, this marks the end of our White wave bamboo longboard review. So far, we got to know that it is perfect for downhill cruising; it’s durable, dependable and pretty strong too. Well yes, there are a few flaws, but they are nothing that can’t be fixed. Its performance and quality construction outweigh all the cons, to be honest. Use it well, and you will be cruising on it for years to come. The White wave bamboo longboard won’t disappoint; highly recommended! I am often to running a blog and i actually respect your content. The article has really peaks my interest. I am going to bookmark your website and maintain checking for brand new information.